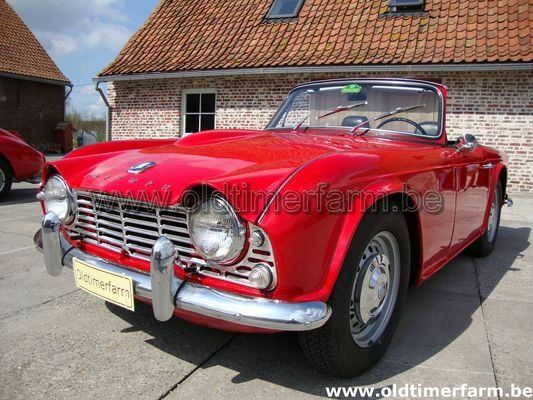 (from Wikipedia, the free encyclopedia) The Triumph TR4 was a sports car built in the United Kingdom by the Standard Triumph Motor Company and introduced in 1961. Code named "Zest" during development, the car was based on the chassis and drivetrain of the previous TR sports cars, but with a modern Michelotti styled body. 40,253 cars were built during production years. The TR4 proved very successful and continued the rugged, "hairy-chested" image that the previous TRs had enjoyed. The new TR4 body style did away with the classical cutaway door design of the previous TRs to allow for wind-down (roll-up) windows (in place of less convenient side-curtains), and the angular rear allowed a boot (trunk) with considerable capacity for a sports car. Advanced features included the first use of adjustable fascia ventilation in a production car and the option of a unique hard top that consisted of a fixed glass rear window (called a backlight) with an integral rollbar and a detachable, steel centre panel (aluminium for the first 500 units). This was the first such roof system on a production car and preceded by 5 years the Porsche 911/912 Targa, which has since become a generic name for this style of top. On the TR4 the rigid roof panel was replaceable with an easily folded and stowed vinyl insert and supporting frame called a Surrey Top. The entire hard top assembly is often mistakenly referred to as a "Surrey Top". In original factory parts catalogues the rigid top and backlight assembly is listed as the "Hard Top" kit. The vinyl insert and frame are offered separately as a "Surrey Top". Features such as wind-down windows were seen as a necessary step forward to meet competition and achieve good sales in the important US market, where the vast majority of TR4s were eventually sold. However, dealers had concerns buyers might not fully appreciate the new amenities so a special short run of TR3A (commonly called TR3"B") were produced in 1961 and '62. 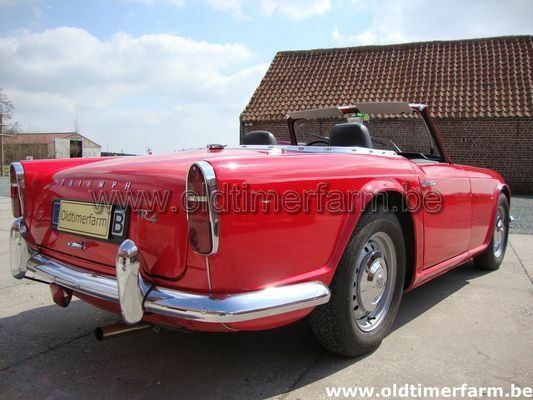 In 1965, the TR4A with IRS or independent rear suspension superseded the TR4. Apart from the rear suspension, which used trailing arms and a differential bolted to the redesigned chassis frame and a number of small styling changes and refinements, the two models appear nearly identical. In fact, an estimated 25% of TR4As were not equipped with IRS, but instead reverted to a live axle design similar to the TR4, which was adapted to fit the new chassis. Characteristics. Body : length/width/height/wheelbase – cm (in) : 394/147/127/224 (155.1/58/50/88); weight : 965 kg (2130 lbs). Engine : 4-cylinders 2138 cc (130 cid), front-mounted, 4-speed gearbox, manual, rear-wheel drive. Power : 104 bhp @4700 rpm. Op speed : 176 km/h (109 mph).